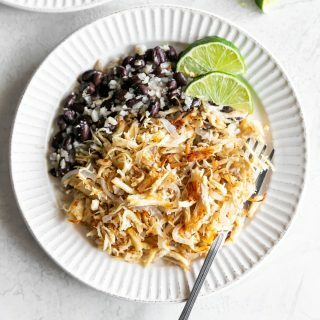 Easy-to-make Cuban crispy shredded chicken with homemade mojo marinate, pan-fried with sautéed onions. Great use for leftover chicken! Vaca frita de pollo is a delicious Cuban chicken dish made with crispy shredded chicken and mojo marinade. But here’s the thing, the word vaca frita translates to “fried cow”. So why is this called vaca frita if it’s not made with beef? Because the way authentic vaca frita is made is by shredded beef and pan frying it until crispy. So, in this context/recipe, vaca frita is used as more of the cooking style for the chicken than an actual crispy beef dish. And I must say, it’s delicious! 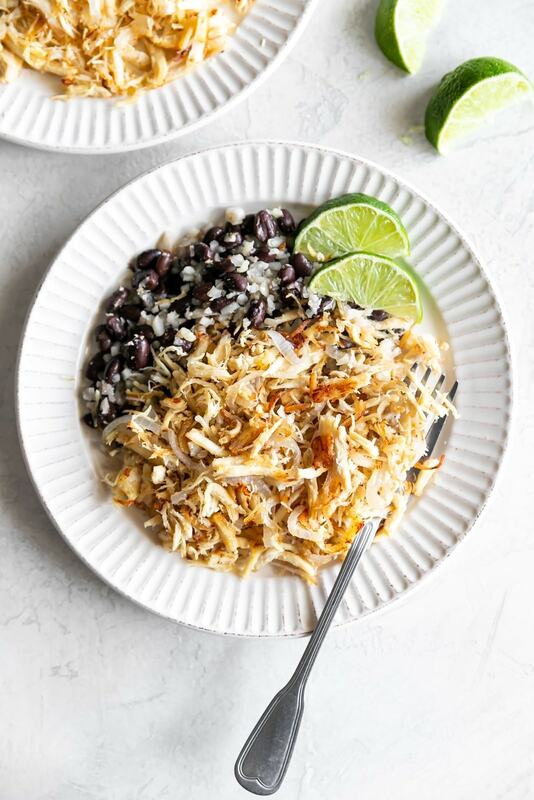 The crispy shredded chicken tastes citrusy and fresh yet crispy with sautéed onions. YUM! So let’s start things off by making the mojo marinade. This marinade comes together easily. First, you need to mash the garlic into a paste-like consistency. You can do this with a mortar and pestle, or simply mash the garlic with the side of a knife, chop, mash again, chop, mash again, until you get the consistency you want which is a delicious garlicky mushy paste. Once that’s done, add the garlic into a large jar with oregano, cumin, salt, pepper, orange, orange zest, lemon juice, lime juice and olive oil. Cover and shake, shake, shake until well combined. You should have approximately 1.5 cups of mojo marinade. Feel free to taste and adjust seasoning. The marinade should taste tangy, citrusy, garlicky, and slightly sour. SO GOOD omg. Once you have the marinade ready, you need to marinate the chicken. But first, make sure the chicken is cooked and shredded. To cook and shred chicken, you can either place the chicken breasts in a slow cooker for 2-3 hours on high or poach the chicken breasts until cooked then shred them with 2 forks. You can also buy a rotisserie chicken and shred that. Promise, I won’t tell. Transfer the cooked and shredded chicken to a bowl and add the marinade. Let it sit in the fridge for 20 minutes or longer. The longer, the better. When you’re ready to start cooking, heat olive oil in a skillet and sauté onions for 2 minutes or so then add the chicken. Cook the chicken at medium-high heat for 10 minutes, flipping over occasionally so all sides get crispy. You want crispy not burned so keep an eye on it. Once you’re chicken is crispy, serve with cauliflower congri, black beans, white rice, cauliflower rice or salad and lime wedges. That’s it! Healthy and full of flavor. Full recipe is below. Hope you love this dish as much as I do! 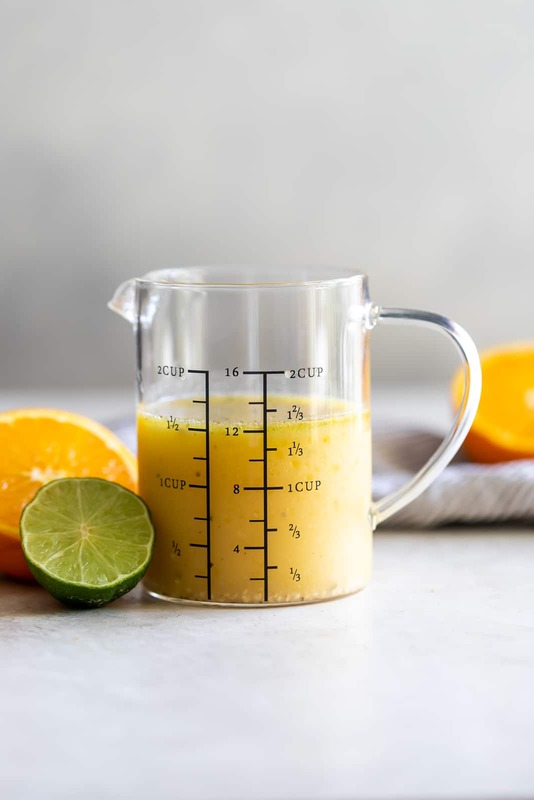 In a large mason jar, add garlic, oregano, cumin, salt, pepper, orange, orange zest, lemon juice, lime juice and olive oil. Cover and shake it up until well combined. Set aside. This recipe makes ~1.5 cups of mojo marinade. Feel free to taste and adjust seasoning. The marinade should taste tangy, citrusy, garlicky, and slightly sour. In a bowl, add cooked shredded chicken with homemade mojo marinade. Marinate for at least 20 minutes. The longer the better. In a skillet, add 1 tablespoon of olive oil and sauté onions until translucent. Add remaining tablespoon of olive oil and marinated shredded chicken. Pan fry for about 10 minutes, until brown and crispy. Transfer to a plate. Serve with cauliflower congri, salad or black beans and rice.